Revelations that former Secretary of State Hillary Clinton primarily conducted official state business using a private email address has prompted congressional investigators to ratchet up legal pressure on the likely Democratic presidential nominee, according to leading lawmakers and sources familiar with the ongoing investigations. "Secretary Clinton's claim that she asked the State Department to release her emails is meaningless since they only have access to the emails she chose to provide them," Rep. Peter Roskam (R., Ill.), a member of the Select Committee on Benghazi, said Thursday. "The Committee will use all tools at our disposal to ensure we obtain every relevant email, potentially including ones Mrs. Clinton, her political advisers and lawyers chose to hold back, as we compile a full and complete record of the facts on the Benghazi attacks," Roskam revealed. Clinton has become engulfed in controversy following the disclosure that she conducted official government business from a private email address, which appears to run counter to established security protocols and regulations governing communication between executive branch officials. Congressional investigators looking into Clinton’s conduct during the 2012 terror attacks in Benghazi, Libya, that killed four Americans say they will step up their inquiry into Clinton following these new disclosures, which one leading lawmaker described as Nixonian in nature. At issue is the possibility that Clinton intentionally failed to submit to Congress reams of correspondence that may have taken place over this private account, rather than over Clinton’s official State Department email address. While the committee was aware that Clinton had been using a private email address, it did not know until recent weeks that she was using the account almost exclusively, according to sources familiar with the issue. Sources tracking Congress’ investigation into the Benghazi attacks further told the Washington Free Beacon that lawmakers are becoming frustrated with what they see as the Clinton machine’s continuous stalling tactics. "The Committee is clearly running out of patience for these stall tactics," the source said. "They are ratcheting up efforts to get every piece of information relevant to the investigation in order to finally hold those responsible accountable." "Secretary Clinton owes the American people an explanation for what appears to be an intentional attempt to evade federal record protocols," the source said. "Lawmakers seem poised to ensure these questions are answered in order to finally get to the bottom of this." Clinton said on Thursday in a tweet that she had asked the State Department to release all of her emails, though it remains unclear how the department could fully track an email address it did not operate. A spokesman for the Benghazi committee said it "is in possession of records with two separate and distinct email addresses used by former Secretary Clinton and dated during the time she was Secretary of State." "Without access to the relevant electronic information and stored data on the server—which was reportedly registered to her home—there is no way the Committee, or anyone else, can fully explain why the committee uncovered two email addresses," the spokesman said. 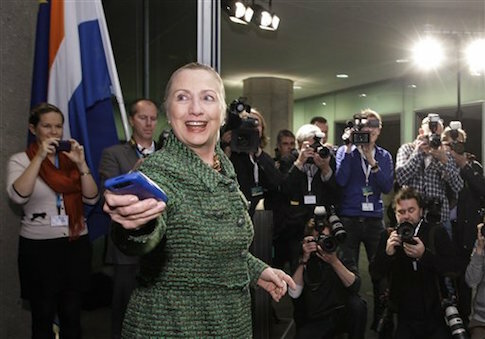 "I want the public to see my email," Clinton said Wednesday evening via Twitter. "I asked State to release them. They said they will review them for release as soon as possible." Roskam said in a subsequent statement that the Benghazi committee has been fighting with the State Department for months to gain access to all Obama administration communications pertaining to the 2012 attacks. "For months the Select Committee has pressed the State Department for access to all communications from key officials on watch during the Benghazi terrorist attacks," Roskam said. "Yet until last week the administration failed to mention that countless emails from Secretary Clinton have been missing from this search because she exclusively used private accounts during her tenure." "The last time we saw a high government official seeking to edit their own responses was President Nixon, and at least then he enjoyed the benefit of executive privilege," Roskam added. "We have said from the beginning that our investigation would follow the facts wherever they lead us—and we intend to keep that promise by reviewing all of the relevant facts and documents in order to issue the definitive report on what happened before, during, and after the terrorist attacks in Benghazi," Roskam added.